For two years in a row, the Saint Louis Zoo has been named the best zoo in the country in USA Today’s 10Best Readers’ Choice Awards. This repeated honor reflects what area residents have known for years: We have the best zoo. 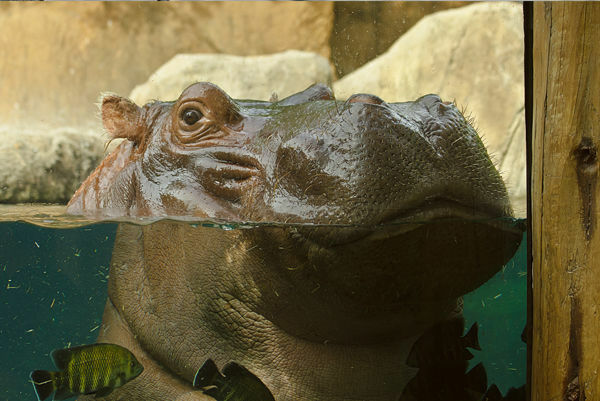 For more than 100 years, the Saint Louis Zoo has made a name for itself through its exceptional efforts in conservation and education, offering visitors the chance to see 18,000 animals from 600 species – all for free. What many zoogoers might not realize, though, is that they can get an even closer look at some of their favorite zoo residents through the behind-the-scenes tours program. This program launched in 2005 and has been met with great enthusiasm over the past 14 years. Mandi Nordin, a group tour agent with the zoo, notes that it started by offering just a few tours initially but has since expanded to give visitors an inside look at 15 areas behind the zoo enclosures. The tours are broken up into animal tours, animal-care tours and “geek tours,” which include a glimpse into how the zoo operates with components like water conservation and business operations. The animal tours are wildly popular, allowing guests to do things like visit the off-display cheetah habitats with a zookeeper, feed the zoo’s reticulated giraffes and have an “up close and personal” visit with penguins. Other tours include the popular Big Cat Tales tour, which gives guests the opportunity to visit the African lions or the Amur tigers and learn about their training, enrichment and conservation in the wild; the Hippo Howdy tour, which introduces guests to the third-largest land animal in the world as zookeepers share specifics about the daily care and training of hippos that live at the River’s Edge; and the Sea Lion Encounter, where visitors can watch the zookeepers train the California sea lions and go behind the scenes of the Sea Lion Show. Nordin notes that the zoo does tours all year, but the availability of certain programs may vary greatly with the seasons. Fees for the different tours vary, with most costing between $35 and $60 per person, depending on the experience. Nordin encourages tour hopefuls to submit their tour requests as early as possible, since many fill up months in advance, especially with the spring and summer months approaching. She recommends gift certificates as great presents that are experiential rather than materialistic. General behind-the-scenes tours are open to the public and can accommodate groups of various sizes. Often, this enthusiasm for the zoo develops into visitors becoming committed donors and joining what is known as the Marlin Perkins Society. The society, which was started in 1991, was named for the American zoologist best known as a host of the TV program Mutual of Omaha’s Wild Kingdom from 1963 to 1985. He also served as the Saint Louis Zoo’s director for a number of years and is remembered for bringing the adventure of the wild and wild animals to people’s homes through his TV show. “We wanted to celebrate his legacy and share his passion with our donors,” says Catherine Langreder, director of annual gifts at the zoo. The society started with fewer than 50 people as a way to recognize those who donate $1,000 or more to the zoo each year. In its 28 years, the society has now grown to almost 1,200 members. One perk of being a Marlin Perkins Society member is its unique behind-the-scenes tour aspect, which differs from the tours available to the public and includes a private golf cart tour of the zoo grounds, as well. Langreder notes that families often do the society tours as a yearly or regular tradition and says that one family comes every year on Thanksgiving while the turkey’s in the oven. Tours are an annual benefit of the Marlin Perkins Society, and members receive behind-the-scenes access at the zoo even if it’s not tour-related. They’re privy to new exhibits and opportunities like seeing the zoo’s new cheetah cubs before the public.